I end up cooking pasta for dinner a fair amount. And while I love to make the traditional pasta recipes, like spaghetti and meatballs, many of which I grew up on, those traditional recipes can take a long time to make. And "a long to make" don't jive with a weeknight schedule. So I love to have a few techniques in my back pocket that allow me to take fresh ingredients, treat them simply and come up with something special. In this recipe video, I do just that with some thick spaghetti and some fava beans (no nice Chianti). 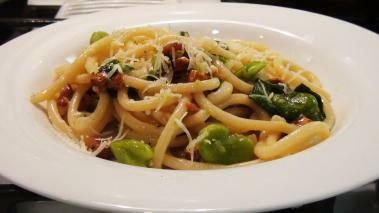 Fava’s are a great spring time vegetable, and although they take an extra 10 - 15 minutes to prep, you can get a great tasty pasta dish like this one in less than an hour. Hope you enjoy! Pile the pasta high and enjoy!! Hope you enjoy it, and leave me a comment to let me know how it goes.